Faun Druzilla (Davis) Cole was born in Price, Utah on Friday, April 15, 1927. She and her twin sister Fern Stella were daughters of LeRoy Payton and Ruth Helen (Rons) Davis. She went to be with her Lord on Thursday, September 20, 2018 at the age of 91 following a stroke and complications. Funeral will be at First Baptist Church, 209 South Fourth Street, Douglas, Wyoming on Saturday, September 29, 2018 at 11:00 A.M. with Pastor Bill Williamson officiating and interment will be at Douglas Park Cemetery. Faun received her early education in Mohrland and Hiawatha, Utah. She loved her childhood years in the coal-mining town and loved to tell stories of what life was like in a small town with many different cultures. She graduated from Carbon County High School in Price, Utah in 1945. Faun served in the Cadet Nurse Corps one year in Ogden, Utah. She graduated from Westminster College, Salt Lake City, Utah with a bachelor’s degree in 1949. She also attended summer school at the University of Wyoming in Laramie, Wyoming, where a fall from a horse introduced her to Lyle Cole, her cowboy sweetheart. Faun taught fourth grade in Douglas, Wyoming at the South Grade School from 1949-1950. Then she married Lyle Dean Cole on June 3, 1950. They lived on the Joss ranch near Manville, Wyoming then later moved back to Douglas. Faun and Lyle were the parents of six children and Lyle worked for the City of Douglas and Converse County for many years. Faun taught in many rural schools and kindergarten in Douglas off and on while raising their children. In 1971 she and her friend, Peg Hiser Fetterman, began the first child care center in Douglas. She was preschool teacher and co-director of 5 C’s for 21 years, retiring in 1992. Her husband, Lyle was killed in 1990 while working as caretaker of the cemetery. Faun was a member of First Baptist Church since 1952. She served her Lord and Savior as a Sunday School teacher and in many other areas until she could no longer serve as teacher. She then became a leader of the prayer group almost up to the time she passed away. 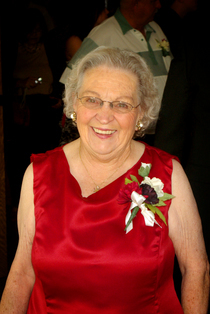 Faun was a member of the North Platte Homemakers for 66 years. Faun was a member of Converse County Historical Society, Wyoming Farm Bureau, The Indian Paintbrusher’s Art Guild, and Wyoming Writers. She was a 4-H leader for many decades, a volunteer at Michael Manor, the Prison Ministry, Christian Women’s Club, the Senior Center and the AWANA club over the years. She attended many Bible studies where she learned more about the word of the Lord. Faun especially loved her children and grandchildren. She loved teaching children also. She loved the western life-style, beautiful scenery, wildlife, cattle and horses. One of her favorite pastimes was checking the cattle during calving season with Lyle. In her later years, she wrote poetry and stories, painted pictures and volunteered at the Senior Center. Faun loved people and everyone she met became a friend to her. Faun’s main goal in life was to be a faithful follower of Christ and help others find their way to salvation through Jesus Christ. Preceding her in death was her father, LeRoy Payton Davis, on December 27, 1975; mother, Ruth Helen Davis, on July 21, 1977; husband, Lyle Dean Cole, on December 28, 1990; her twin, Fern Stella Davis; her older sister, Hazel Marie Davis; older brother, LeRoy C. Davis who was lost at sea in World War II; younger brother, Glenn Maxwell Davis; and her oldest grandson, Dana Penn Jr. Survivors include her six children, Eugene Lyle (Lee) Cole, Ruth Ann (Dana) Penn, Daniel LeRoy (Cheryl) Cole, Laurie Jane (Brian) Seipel, Jason Mark Cole all of Douglas and Glenn Elvin (Dawn) Cole of Soldotna, Alaska. Also surviving is her brother, Gary Stewart Davis of Albuquerque, New Mexico; twelve grandchildren, Jeffrey Cole, Rebecca Cole, Dion Penn, Nate Penn, Narcissa Erskine, Alyssa Penn, Shane Cole, Halley Neumann, Danneil Ware, LeJae Seipel, Jason Cole II, and Tirzah Parks; twenty great-grandchildren; one great-great-granddaughter; four sisters-in-law; and one brother-in-law and their spouses. A memorial to the First Baptist Church, 221 South Fourth Street, Douglas, Wyoming 82633, Douglas Senior Citizens’ Center, P.O. Box 192, Douglas, Wyoming 82633, or the Wyoming Rescue Mission, 230 North Park Street, Casper, Wyoming 82601 would be appreciated by the famly. Serving as pallbearers will be Dion Penn, Shane Cole, Nate Penn, LeJae Seipel, Jeffrey Cole, and Jason Cole II. Serving as honorary pallbearers will be all of her grandchildren and great grandchildren.